We’d like you to choose Traction to propel your country dance, barn dance or ceilidh. Whatever name you want to give it, Traction will work with you to give everyone a really enjoyable time. Traction aims to lead you and your guests through a lively, sociable and memorable event. You are welcome to come to us for advice at any time but here are a few tips to make your job as organiser easier and more productive. We hope you will find this advice useful. Don’t hesitate to contact us if you have any further queries. …is simple and designed to be done, rather than watched. Experience and agility are not essential. Simply be prepared to have a go: you won’t be the only one making mistakes and the occasional bump is all part of the fun. There will probably be time for 8-12 dances in the course of the evening. … is to make sure everyone knows what to do. He or she will talk you slowly through each dance before it begins. You’ll soon recognise many of the common movements. The Caller will choose dances to suit the audience and will repeat the instructions as you dance to keep you going in the right direction. Please try to get him or her a box or stage to stand on. As organiser of the event, you can decide how to timetable the evening. Be sure to get to know the caller and discuss your needs and plans. Dress comfortably but otherwise wear whatever you like. Flat shoes are much better than heels. Fans of bare feet should watch out for the novice in Doc Marten boots. You could get quite warm, so avoid thick woollies over your Janet Reger smalls. If you must wear a cowboy outfit, leave the spurs outside with your horse! The main requirements are a firm, level floor that isn’t too slippery, enough light to see where you’re going and plenty of ventilation – folk dancing raises the air temperature something wonderful. The band will need to be above water level and under some kind of a roof if there’s any chance of dew or rain. The electrical equipment must be kept dry (whilst the insides of the band need to be kept wet). Traction uses amplification. Anyone wanting to chat should avoid sitting near the speakers. Although we play only loudly enough to be heard clearly inside the dance hall, do consider your neighbours! Barns can be wonderful places for dancing but they often carry a greater fire risk – partly because of dust from straw and so on. We need to keep our instruments and electrical equipment away from dust. Your guests might suffer from hay fever or asthma, so think carefully. Your guests and the band will appreciate starting and finishing on time. It looks more professional and helps everyone organise their evening. Encourage your guests to arrive 15 minutes before the start. If wished, the band can play some music to listen to while the stragglers are arriving. The Caller usually plans a few short pauses into the programme for dancers to get their breath back. Traction can fill these gaps with music if you wish. Most dances have a break for refreshments (there’s no rule about this), which lasts for 30 to 45 minutes. A sit-down meal or a lavish buffet will make a big hole in the time available for dancing. We find that eating always takes longer than planned! Youngsters usually enjoy folk dancing as much as the grown-ups but the height differences can be a problem. You might prefer to get the little ’uns session over with early in the evening, so the bigger kids can let rip later. Alternatively, you could keep the young children together in their own ‘set’, where they will be better matched. It’s your choice entirely. It does happen that events sometimes get off to a late start. If this is the fault of the band, come and talk to us and we’ll see if we can work a little late for you. Traction doesn’t usually play after midnight and does need time to pack up all the gear at the end. If you want to keep dancing into the night, well, ask us and we’ll see what we can do. But don’t forget the caretaker! 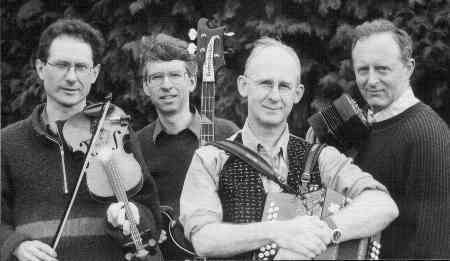 As folk musicians, we don’t tend to know a lot of pop tunes, Gershwin or even country and western. We do run to “Happy Birthday” and the odd waltz but it’s no use asking us to play for an hour of jive or line dancing. All the same, we’re very approachable and we promise not to make jokes about your cowboy hat. Three members of Traction also offer a wide range of folk songs and tunes that are very entertaining. For a small extra charge, a musical interlude can be provided.